Is your house making you sick? Are you worried about the harmful effects of indoor air pollution? According to the Environmental Protection Agency (EPA), health problems caused by indoor air are an issue in 8 out of 10 homes. The condition of your home's air can affect your family's health and comfort. You want your family to breathe the cleanest, healthiest air possible, and Dr. Energy Saver, A Blackdog Affiliate can provide the solutions you need for a healthy, comfortable home. Contact us today for an in-home consultation. We'll ask your about your symptoms and provide a free estimate for services to meet your specific needs. 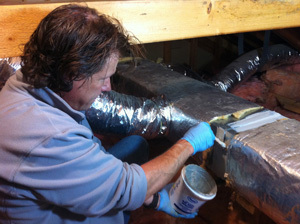 We offer a wide range of solutions, including dehumidifiers, replacement windows and duct sealing. The term "Sick Building Syndrome" (SBS) was first used by the World Health Organization in 1986, when studies linked certain health problems to a variety of indoor air pollutants that became more concentrated as buildings became “tighter” in an effort to improve energy efficiency. Volatile organic compounds (VOCs) like formaldehyde were initially identified as major indoor air pollutants. Do family members have ailments associated with “sick building syndrome” or “building-related illness” (BRI)? Although medical doctors can treat the health symptoms caused by SBS or indoor air pollution; without addressing the indoor air quality (IAQ) issues in the home, health symptoms are likely to come back - or never actually go away. If you’re worried about indoor air quality and the overall healthfulness of your home, Dr. Energy Saver, A Blackdog Affiliate can help. In the same way that a medical doctor is trained to diagnose and treat illnesses of the human body, Dr. Energy Saver, A Blackdog Affiliate's technicians are trained and certified to detect and correct building defects that cause indoor air quality problems. The condition of the air in your home, including temperature, humidity and health, can have a huge impact on your family's health and comfort. Air that's too dry can cause dry, itchy skin and increase your chances of getting a cold or the flu. Air with excessive moisture can be caused by mold in the basement, crawl space or another area of the home. Unhealthy air can trigger allergies or asthma. By controlling your indoor humidity levels, air purity and temperature, you can easily maintain a healthier, more comfortable home environment. We install products, such as dehumidification systems, insulation and replacement windows, that are designed to work together to treat and protect your home year-round. Here at Dr. Energy Saver, A Blackdog Affiliate, we have the expertise and training to accurately diagnose indoor air quality issues and resolve them with proven solutions. Guided by building science principles, our thorough building analysis will identify your home’s specific issues, recommend the most cost-effective solutions and complete the remedies you select. You don't have to deal with a "sick" home any longer! Contact us today for your no-obligation indoor air quality inspection and free estimate in Massachusetts & New Hampshire. We are the trusted home energy and air quality contractor in Andover, Haverhill, Methuen and nearby.